2006. Pen & ink. 5" x 7"
We got a new puppy in 2006 (“Odin,” to go with our other dog at the time “Loki”). He’s half-Springer spaniel, half-Australian shepherd; and like all puppies he was amazingly destructive. 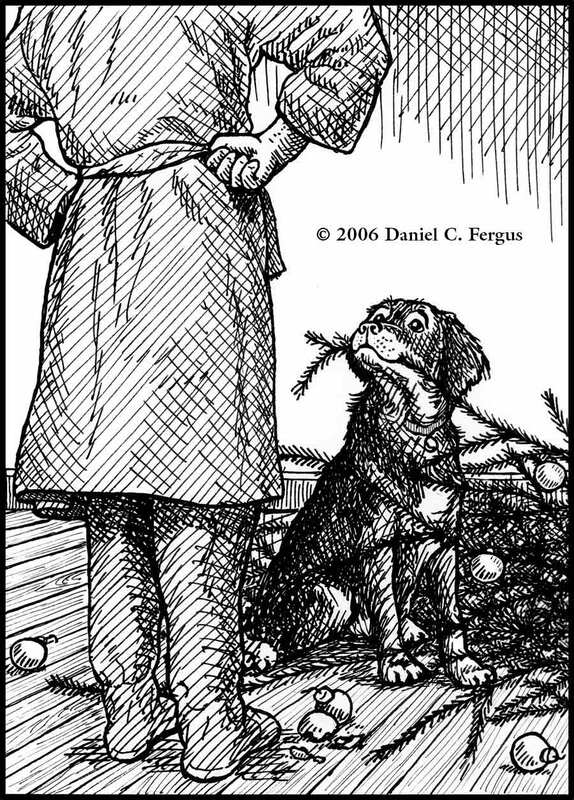 The scene depicted here, which I drew for our annual Christmas card, seemed pretty likely as the Christmas season approached Ironically, as it turned out, the Christmas tree was one of the only things in our house the puppy didn’t chew to shreds. He completely ignored it! (Well not completely; he did manage to break a few low hanging ornaments). On the interior of the card I wrote-out the lyrics to O Tannenbaum in German. My grandfather, who was German, really appreciated the card. He passed away about a month later; I'm glad he got to see this one before he died.